LED Heliball uses your hands or feet as the controller! 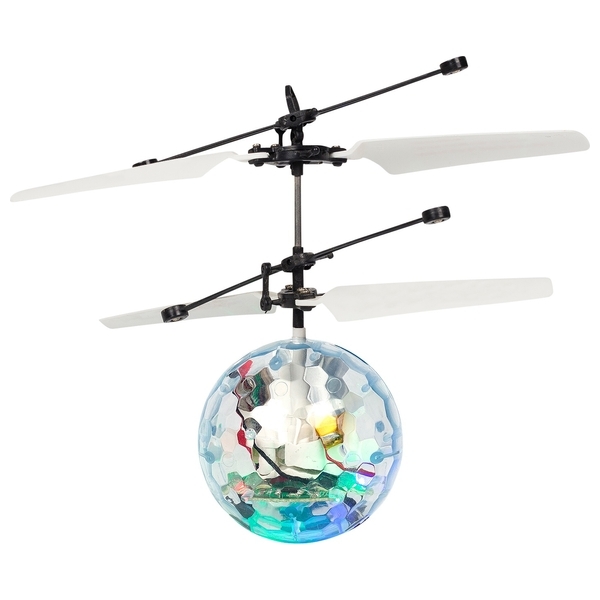 This fantastic flying toy features super bright LED lights for a unique flying experience. Switch between the 3 light modes for a spectacular night time light show. The LED Heliball features 2 adjustable flight modes. Activate the patented proximity sensors to enter Auto Hover mode and control the Heliball with your hands or feet. In Auto Hover mode, this clever flier will gently return to the ground unless you place a solid object below it. When the LED Heliball senses something below it, it flies skywards! Wave your arms, hands, feet or a book beneath the Heliball to send it soaring upwards for a moment before it starts to lower to the ground again. Use the handset controller to switch between Auto Hover and Manual modes. In Manual mode, you can use the controller to take control of the speed and height of the LED Heliball. This clever flying toy even features a fast charge option that lets you take to the air for 3 minutesf continuous flight after only 5 minutes of charging! Guide a soaring LED light show with your hands, feet or the controller! Flying drones requires a certain level of skill. Practice flying in an obstacle-free area, with the drone guardrails attached, and be prepared for the inevitable bump and crash as you learn to fly. Not suitable for younger children. EU Warning: Not suitable for children under the age of 3 years due to small parts which could cause a choking hazard. Use only under adult supervision, do not touch/access the rotating propeller. To be used in domestic area (house and garden) only.